Is it Time to Think About Fertilizing Peppers? That depends on how developed the plants are. When it comes to fertilizing peppers, moderation is the key. You should usually not fertilize pepper plants the first few weeks after transplanting them, especially with fertilizer containing higher levels of nitrogen. This may cause an over abundance of green growth and very little fruit production. 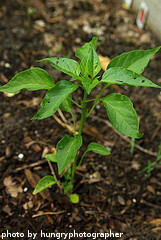 You can put down fertilizer in your garden or container a couple of weeks before transplanting the pepper plants. After the plants produce blossoms, it's OK to fertilize them. 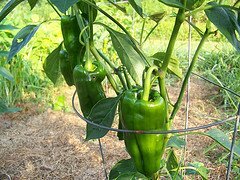 Several different types of fertilizers work well for peppers. Most stores that have large garden departments will carry the appropriate fertilizers. Pay attention to the 3 number code on the bag of fertilizer. These three numbers indicate the amount of nitrogen, phosphate and potassium that are contained in that particular fertilizer, respectively. For instance, a 10-10-10 fertilizer contains 10% nitrogen, 10% phosphate and 10% potassium. A 5-10-10 bag would contain 5% percent nitrogen. A 10-5-10 bag would contain 10% nitrogen, 5% phosphate and 10% potassium. When fertilizing your peppers, look for 5-10-10 fertilizer. This contains half as much nitrogen as phosphate and potassium. A higher phosphate and potassium number will encourage more fruit production. A lower nitrogen number will help the plant grow, without doing it at the expense of producing fruit. If you are using a water soluble fertilizer (the kind you dissolve in water and then spray on your garden), try to avoid spraying the fertilizer on tops of the plants. Wet leaves, branches, blossoms and fruit are more likely to develop diseases. It's better to concentrate your efforts at the base of the plant. 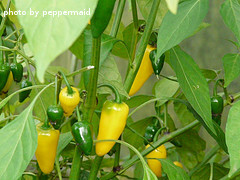 Click here to learn more about watering pepper plants. After fertilizing peppers, it's a good idea to apply a layer of mulch around the plants. Grass clippings, chopped up leaves, hay, etc... work well for mulch. Applying a layer of mulch will prevent the evaporation of moisture from the soil. It will also help control weeds. At the end of the growing season, you can till the mulch into the garden and it will add nutrients to the soil during the winter. Mulch is not usually necessary in container gardens.